Integrating an IBM WebSphere Application Server for z/OS cluster with IBM Tivoli Access Manager is challenging. Tailoring the business this way allows administrators to facilitate the best of both worlds, so they can focus WebSphere Application Server as a Java environment provider and Tivoli Access Manager as a security policy enforcer. 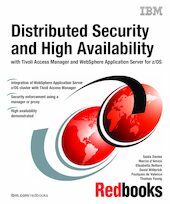 This IBM Redbooks publication gives you a broad understanding of how you can enforce security for IBM WebSphere Application Server on z/OS, by using IBM Tivoli Access Manager on a distributed platform. It explains how you can achieve security, scalability, and high availability by adding and further configuring resources to a computing environment. Specific products are employed for their functions and strengths. And, basic products are configured to demonstrate their high availability characteristics.